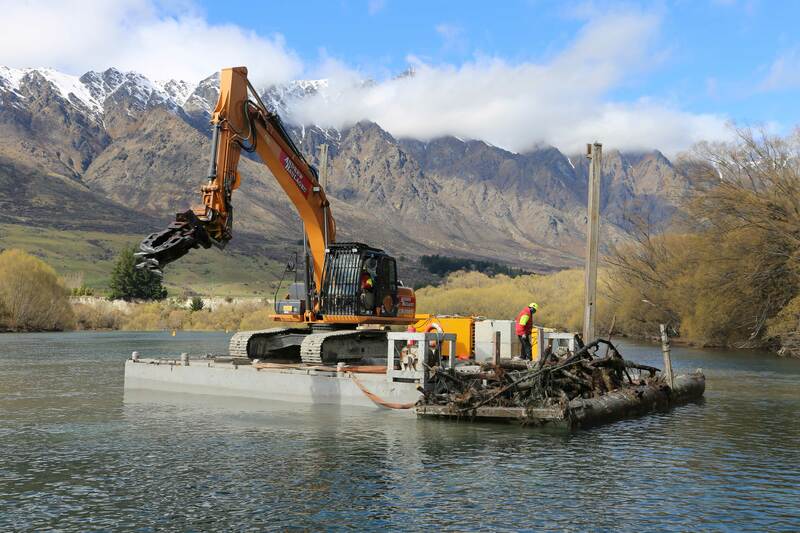 The latest battleground is the Upper Kawarau River at the outlet of Lake Wakatipu, where a 10-hectare mass of lagarosiphon sits less than 1km from the Kawarau Falls Bridge. The Kawarau River is an adventure tourism hot-spot, which makes the likelihood of inadvertent infestation of the lake a real hazard. In May of 2017, three sections of the upper Kawarau River were cordoned off with buoys to restrict lagarosiphon from spreading into the lake. 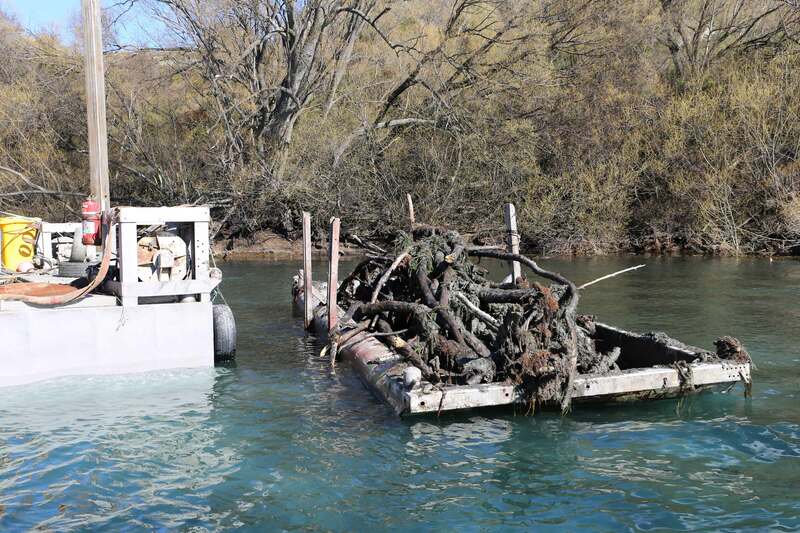 It was determined that a large mass of dead, submerged willow trees in the Upper Kawarau was providing a habitat for lagarosiphon and impeding biosecurity efforts — including the installation of biodegradable hessian mats, which have proved effective in managing lagarosiphon in lakes Dunstan and Wanaka. At first, it was thought that divers could manually remove the willows, but the sheer volume of material made this unsafe, and impractical. 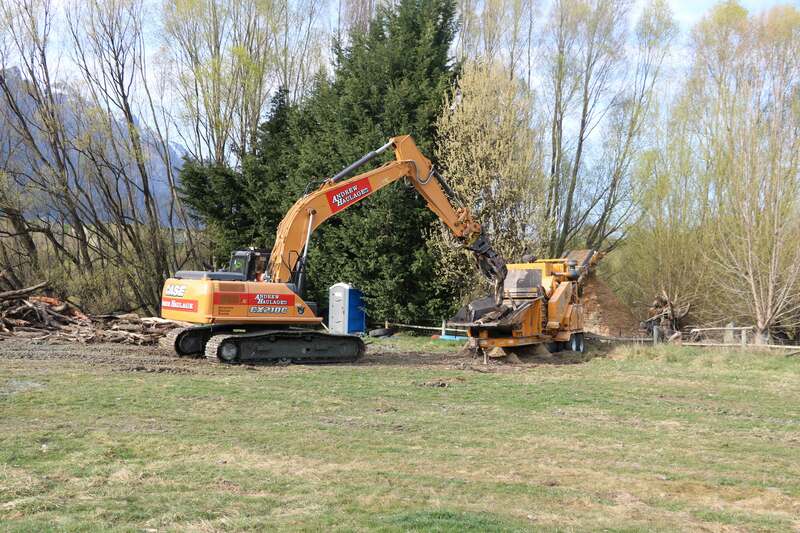 Instead, Otago Regional Council funded a large barge with a 24-ton digger to remove over 150 tons of woody vegetation from the riverbed. The success of this operation has resulted in an unexpected but much-appreciated gift for a nearby family-run zoo. Queenstown Zoological Gardens was founded by local resident Ivan Young in 1965 and is now run by his daughter Rachel. Along with tending to a menagerie – including ponies, ducks, peacocks and rabbits – Rachel is involved with planting native trees and working with local primary schools to help educate children. The recovered willows have been chipped into 150 tons of mulch and the donation represents a huge cost savings for this local non-profit organisation. Rachel says that involving workers from the Department of Corrections in the construction of these ‘islands’, and children from the local school to do the planting, is her way of continuing her father’s legacy of grassroots, hands-on ecology education in the Queenstown area.